The Coast to Coast walk is a spectacular 190 mile route crossing the North of England. 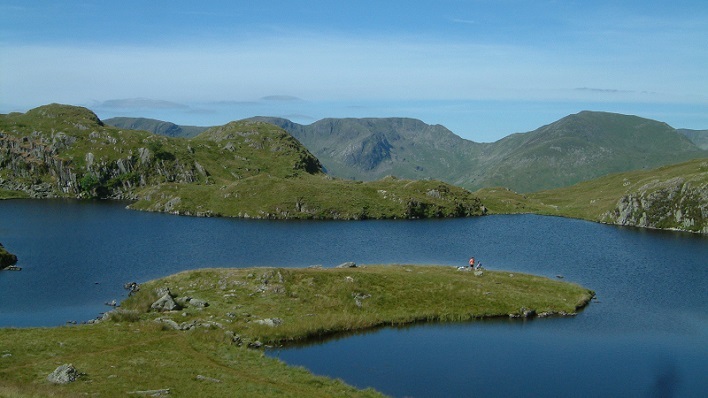 The route was devised by renowned walker and writer Alfred Wainwright and has become one of the most inspiring long distance walks in the world. You walk from west to east through stunning scenery, crossing three National Parks - the Lake District, Yorkshire Dales and North York Moors. You start your guided coast to coast walking holiday at St Bees and follow the coastline before heading east and entering the Lake District National Park, home to spectacular lake and mountain scenery. Between the Lake District and Yorkshire Dales the Coast to Coast route levels to cross undulating farmland. From Kirkby Stephen the route climbs into the Pennine Hills and visits the mystical cairns atop Nine Standards Rigg. You continue through beautiful Swaledale to Richmond, a historic market town founded by the Normans. You leave the Yorkshire Dales and cross the low lying Vale of Mowbray to the North York Moors. From here the trail leads you on a roller coaster across the heather covered hills to the North Sea and finale of your coast to coast journey at Robin Hoods Bay. The terrain on this trail is a diversity of rocky mountain paths, limestone plateau’s, country lanes, rolling hillsides and farmland. If you are contemplating the Coast to Coast walk and would like to gain a better idea of its landscapes and terrain please click on Coast to Coast photo diary. Each night on the trail you stay in a different village along the route in selected walker friendly accommodation, with breakfast provided. Your luggage is transferred between accommodation each day. The minibus service will also transfer you with your luggage if you are ill or injured. *We have a limited number of single occupancy rooms available on this tour for a supplement of £280 per person. However if you are a single traveller and do not require single occupancy we will room you in a twin room (with two single beds) with a fellow traveller of the same gender, and therefore you will not be charged the single occupancy supplement. On each Guided Coast to Coast holiday groups are a maximum of 12 people plus a Guide. Above are the holiday dates and the places still available on each holiday. All holidays are guaranteed to operate. 15 day holiday, 14 nights accommodation, 13 days walking. Robin Hoods Bay, North Yorkshire. The Coast to Coast is a wonderful but challenging route walked at a steady pace, and should not be under estimated. Before you embark on this walk you must be physically fit (stamina for back to back long daily walks/hikes and cardiovascular for steep ascents) and be equipped to meet your challenge. The valleys through the middle section, and the arable land in the eastern section make for straightforward walking, but the hills and mountains of the Lake District, Yorkshire Dales and North York Moors are rugged and gradients can be steep. The terrain on this trail is a diversity of rocky mountain paths, limestone plateau’s, country lanes, rolling hillsides and farmland. 14 nights walker friendly accommodation including breakfast. Experienced Coast to Coast Guide. Backup accommodation to accommodation transfer. Evening meals, packed lunches, drinks and snacks, travel insurance, travel to St Bees and from Robin Hoods Bay, souvenirs, laundry services, etc. We know how incredibly important your accommodation is each night of your coast to coast holiday. That’s why the accommodation provided is in carefully selected walker friendly B&B’s, Guest Houses, small Hotels and Inns. The owners have excellent local knowledge, understand the needs of walkers and are welcoming and want you to enjoy your stay. As a family business we have personally built an excellent reputation and relationship with the owners and managers. Nearly all rooms are en-suite or have a private bathroom. Additional nights accommodation can be booked on request for anyone wishing to arrive in St Bees or depart Robin Hoods Bay a day or two earlier/later. Price from £50 per person per night. This group holiday is a good way to meet like minded people who share a passion to walk the coast to coast. Almost half our customers are single travellers. It’s a great way of meeting new people and making new friends. We have a limited number of single occupancy rooms available on each tour for a supplement. Alternatively if you do not require single occupancy we will room you in a twin room (with two single beds) with a fellow traveller of the same gender, and therefore you will not be charged the single occupancy supplement. Breakfast is included and is served at your accommodation. Your experienced Guide will provide daily information about the route, its varied landscapes and local history and guide the way. Your Guide will provide information about your accommodation and places to eat in the evening, etc. Your Guide is emergency first aid trained. We hope that everyone who joins us on the Coast to Coast route will complete their challenge, however illness and injury sometimes occur. For this reason we are supported by a daily transport service, which can drive you from accommodation to accommodation if needed. There is a laundrette in Kirkby Stephen. Some accommodation owners also provide a laundry service for a small fee. The following is intended to provide some further information about the route and points of interest. Please note that all distances, timings and heights are approximate and along with all the other information are provided as an aid to describe the route. The time to cover the distance includes time spent walking and time for breaks. If further information is required please contact our office. Several guide books providing detailed route descriptions and information are also available. Meet your guide and fellow walking companions at the welcome meeting in the evening. Day 2 St Bees to Ennerdale Bridge (village height above sea level 100M). The seaside village of St Bees on the Cumbria (west) coast is the official starting point for Wainwrights world famous Coast to Coast walk.A plaque on the seafront marks the start of the route. Tradition says to dip your toe in the sea and then collect a small pebble to carry with you to the east coast. Initially our route heads north along the coastal path with views of Scotland and the Isle of Man. We leave the coastal path and head east towards the Lake District Mountains. The route passes through the villages of Sandwith, Moor Row and Cleator followed by a steep walk up Dent (352M), the high point of the day. Admire the views before continuing across the hilltop and descending steeply down a forest track to Nannycatch Beck. We follow the beck and then a roadside path to Ennerdale Bridge. Day 3 Ennerdale Bridge (100M) to Rosthwaite (100M). We follow the country lanes to Ennerdale Water then the rocky path along the banks of the Lake. At the far end of the Lake we take the forest track that climbs gradually along Ennerdale valley to the remote Black Sail Hut YHA (290M). From the YHA continue to the bottom of Loft Beck and a steep ascent to the high point of the day at 600M. The views back to the sea are spectacular. We follow the rocky path across the fell and descend to Honister (330M). Continue descending into the beautiful Borrowdale valley to the village of Seatoller (120M) then follow the footpaths to Rosthwaite. Day 4 Rosthwaite (100M) to Grasmere (75M). We take the track alongside Stonethwaite Beck then a rocky path climbing steadily alongside Greenup Gill. We walk steeply up the steps and rocks (a bit tricky but not technical) to the left side of Lining Crag (500M) and admire the views to the north and east. Continue to Greenup Edge, today’s high point at 620M, and then descend the rocky path to the head of Far Easedale. Your guide then considers several factors and decides to either follow the ridge walk across Calf Crag, Gibson Knott and Helm Crag before descending steeply into Grasmere or take the less arduous route down Far Easedale. Day 5 Grasmere (75M) to Glenridding (150M). We follow the lane to Mill Bridge then take the rocky path which climbs steadily alongside Tongue Gill to Grisedale Tarn (550M). From Grisedale Tarn we follow the route down hill alongside Grisedale Beck to Patterdale valley and the village of Glenridding on the shores of Ullswater. Day 6 Glenridding (150M) to Shap (250M). Day 7 Shap (250M) to Kirkby Stephen (180M). The Lake District Mountains are left behind and the gradients ease to cross the rolling farmland and hills in Eden Valley. We follow the footpaths across the limestone plateau passing the secluded hamlet of Oddendale and the granite boulders deposited by ice age glaciers. Orton lies a mile to the south of the route. We continue over rolling farmland and across the moors passing Sunbiggin, the hidden remains of several ancient settlements, and Smardale Bridge to the market town Kirkby Stephen. Day 8 Kirkby Stephen (180M) to Keld (350M). Across Franks Bridge and head for the lane which becomes a broad path onto the Pennine Moors and the summit of Nine Standards Rigg (662M). Depending on the time of year there are three routes over and around Nine Standards; green (avoiding the summit) for winter and spring, red for early summer, and blue for late summer and autumn. All routes cross peat, which is notoriously boggy in wet weather, before descending to the River Swale and the road in to Keld. Day 9 Keld (350M) to Reeth (200M). The route stays high and crosses moorland that is scarred from a lead mining industry that disappeared at the end of the 19th century. From Keld the route descends to the river then climbs past Crackpot Hall and the ruins of Swinner Gill mine workings. It crosses the moor (580M) before dropping into Gunnerside Gill (400M) and then up onto Melbecks Moor (550M). From here a broad track descends gradually passing the ruins of Old Gang Smelting Mills to Surrender Bridge (350M). The last test of the day is to drop into Cringley Bottom, cross the stream and then continue over the farmland to Reeth. Day 10 Reeth (200M) to Bolton on Swale near Richmond (150M). This is a much easier day’s terrain through rolling countryside passing Marrick Priory, Marske village and Whitecliffe wood. We arrive in Richmond at lunchtime and then continue to Bolton on Swale in the afternoon (to reduce the following day’s distance). Short transfer back to Richmond. Day 11 Bolton on Swale, Richmond (150M) to Ingleby Cross (100M). Transfer back to Bolton on Swale. The route to Danby Wiske is almost level and generally easy going, it crosses farmland and then follows 8 miles of country lanes and then farmland again across the low lying Vale of Mowbray to Ingleby Cross. Day 12 Ingleby Cross (100M) to Blakey Ridge (400M). A rollercoaster day. The path climbs through Arncliffe Wood and joins the Cleveland Way trail. The route then descends into Scugdale (100M). Not keen to stay low the path climbs steadily at first then steeply onto Gold Hill (315M). It continues onto Carlton Moor (408M) before descending to Green Bank (300M). Once again it climbs going over Cringle Moor (430M), descends to 280M back up to 400M, down again to 300M and then a final climb through the Wainstones onto Hasty Bank (398M) before descending to the road at Clay Bank Top (250M). If all the up and down seems like too much hard work there is a path that contours round the hills from Green Bank to Clay Bank. A final steep ascent to Carr Ridge (390M) is followed by a gradual rise to the summit of Round Hill (454M), the highest point on the North York Moors. The path descends to Bloworth Crossing (400M) were it leaves the Cleveland Way and continues on an almost level disused railway line across the desolate moors to the remote Lion Inn on Blakey Ridge. 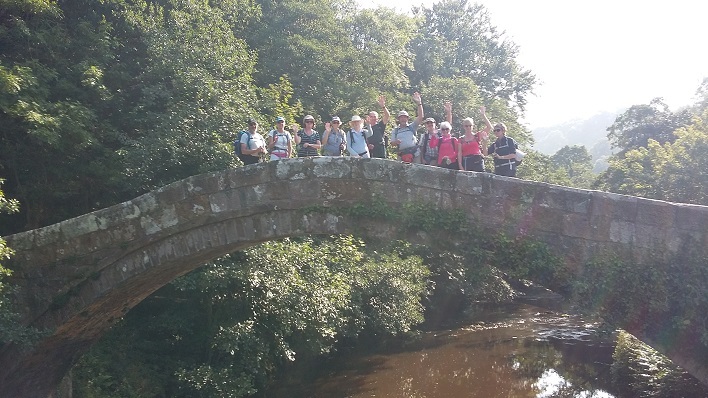 Day 13 Blakey Ridge (400M) to Grosmont (50M). High on the moors we follow a road for a few miles before returning to tracks through the heathers. Another road walk and then the route takes a broad disused track gradually descending Glaisdale Moor into Glaisdale village. The route, never far from the River Esk, passes through woodland to Egton Bridge where it follows a once toll road through the private estate of Egton Manor to Grosmont. Day 14 Grosmont (50M) to Robin Hoods Bay. The road climbs steeply out of Grosmont (its not called the 1 in 3 for nothing) to its high point on Sleights Moor (285M), there are wonderful views to Whitby and the sea. Still on heather moorland the route descends into Littlebeck (50M). After the woodland walk it climbs back up to 200M and crosses a final stretch of heather moorland before following country lanes to the coast. We turn south to follow the coastal path to Robin Hoods Bay and a final last descent to the sea. Follow tradition once more by dipping your boot in the sea and throwing your pebble in (that should baffle the geologists in years to come). Being built on the hillside the street from top to bottom of the village is the final steep descent/ascent on route. Your challenge is complete. After breakfast depart for home, but first you might like to take time to explore this picturesque once fishing village and reputed smugglers haunt. The train station in St Bees is a short walk from your accommodation. Approximate journey times – From Manchester Airport 4 hours. From London 5 hours. Scarborough train station is a 40 minute bus or taxi journey from Robin Hoods Bay. Approximate journey times – To Manchester Airport 3 hours. To London 3 hours. If parking and transfers are required please request at the time of booking. Off road parking in St Bees - price £3.00 per day. Transfer from Robin Hoods Bay to St Bees - price from £110 per person (this transfer is over two days and the price includes a night’s accommodation in Kirkby Stephen). Secure parking in Kirkby Stephen - price £5.00 per day. Transfer from Kirkby Stephen to St Bees - price £30.00 per person (depart 08:30 – arrive 10:15). Transfer from Robin Hoods Bay to Kirkby Stephen - price £30.00 per person (depart 16:00 – arrive 18:15). The most convenient major International airport with rail links is Manchester Airport. Dean, We walked the C2C in September 2018. We were thoroughly satisfied with our experience. Scott, our guide, was knowledgable (having hiked the C2C several dozen times), exercised good judgment, and related well with everyone in the group......From the perspective of a tourist the great variety of accommodations, all eminently suitable, made the journey even more interesting. Northwest Walks handled the logistics of the walk smoothly. We felt that we received more than fair value for the money spent. All in all a worthwhile experience which we heartily recommend and will forever cherish. Hi Dean, My husband and I walked the coast to coast with your company starting on the 1st July this year. It was fabulous, very well organised and John was an excellent guide, I’ve recommended your company to several friends since. Just to say, I did the C 2 C walk this year with North West Walks and it was fantastic! Hi Dean, I want to follow up and thank you and Northwest Walks for my most excellent vacation. As I noted at the outset, I was worried about being physically fit enough to do it, and I was worried, or not so much worried as wondering, in any event, how the group would get along. The hike was a challenge no doubt, and my feet sure took a pounding, but it was my best vacation in a long time. And although the weather didn’t quite cooperate as we might have wished (during the first week), walking for hours in the rain was soon forgotten once we arrived, had a shower, dinner and a clean bed. (More than once I felt sympathy for other hikers we met along the trail who were tenting, and I was very glad I wasn’t doing that.) Our group was terrific, and I have come to think that if someone like you had known everyone beforehand and had handpicked the group, it probably wouldn’t have been as good a mix of people as the group we ended up with. Besides, you probably would never have picked me to be part of it. The one person you did handpick however, was our guide, Dave, and I want to particularly thank you for that excellent choice. Dave was patient, knowledgeable, helpful, responsible, wryly funny and a great companion. This vacation hasn’t been restful, but it’s been rejuvenating, which is even better. Morning Dean & Corinna, Just finished coast 2 coast on Friday & just wanted to say thank you for a great 2 weeks walking across this magnificent country. While it was the toughest thing I've ever done it was also one of most rewarding, - all the accommodation was spot on & a very special mention to our guide Dave for his experience, knowledge & sense of humour, we couldn't have asked for a better person to lead the way & he is a credit to Northwest walks team. Thank you ! Hello Dean, Just to say thank you to yourself and your staff at North west walks for an excellent coast to coast walk experience. From initial contact to the certificate presentation the organisation was excellent. Special mention to John the guide who ensured that the walk was totally stress free. He ensured everything ran smoothly, a great job. The accommodation was excellent throughout……Overall a tremendous experience, I will have no hesitation in recommending North west walks to friends. Also hope to use you again myself in the future. Thanks again. I loved the walk. I consider myself very lucky to have had the chance to see and experience so much of this beautiful country......I am left with a million and one memories of an incredible time. I loved the walk, the country, the scenery, the sheep, the smells, the animals ..... I could go on and on - but I also love what my fellow walkers contributed to my experience. They were all such unique and wonderful people. Thank you once again for everything you did for me and the rest of the group. The planing and management couldn’t be faulted. Many thanks for your great leadership, good humour and encouragement during the walk. I will always remember the walk as a very hard walk done with great companions through beautiful rugged mountains and interesting countryside. I enjoyed the trip immensely and Paul made it so easy with excellent leadership, local knowledge and on schedule every day. The restaurants and packed lunches organised daily meant we could chill out in the evenings after a long day. Not to forget the good laughs and crack along the way. It was the most amazing 2 weeks, tough in parts, but incredible scenery, and a great group to spend time with. I'd like to thank you for all your help and advice along the way.....I'd like to also thank you for the special treat at Ravenseat Farm, meeting with Amanda and Clive will be a special memory for me. Dear Dean, I really enjoyed the Coast to Coast walk I did in the last two weeks of September as well as the company of my fellow walkers. Scott was and excellent and knowledgeable leader. The walk was very well organized and the accommodations were great. I really had a good time. It was hard, but I am glad (and proud!) I did it. Dear Dean and Corinna, Thank you for all the organisation for our recent Coast to Coast group walk. First of all John was wonderful and the group warmed to him quickly with his lovely Yorkshire accent and sayings!! Secondly, all the accommodation was great and the hosts were all very welcoming……Thanks again, your company is great to work with and we look forward to being in touch with you next year to book 2019! Hello dean. I wanted to thank you for a great walking holiday. John did a wonderful job in managing A very diverse group and the b&b were very nice and accommodating……Thanks again for a great experience and we look forward to our Scotland hike next year. Dear Dean: We had a fantastic experience walking the Coast-to-Coast with our group and our leader, Chris Webb, the last two weeks of July! It was simply amazing...something we've always wanted to do, and although it was sometimes quite a challenge for one or the other of us, we both feel very accomplished to have finished it. Chris was an exceptional leader; we can't imagine anyone doing a better job, and he is a very kind, funny, smart, and interesting man as well. We enjoyed the different lodging choices along the way, and had some delicious meals. We took over 1000 photos (happy to share the link if you wish). Thank you for offering this incredible experience! Dear Dean & Corinna, Finished the C to C yesterday and really loved it. We found all your recommendations to be right on the mark! our bags were delivered promptly every day and the various accommodations made the trip so interesting. Chris was an amazing guide! We will recommend your company to others and thank you for making this a trip we will always remember! Hi Dean, Just finished the C2C and it's been a wonderful experience. Chris is an excellent leader and we've had a great group. The weather in the second week could have been kinder but we finished in sunshine. Hi Dean, Just to say how much I enjoyed the guided C2C this month. Scott was an excellent leader and the group, including my roommate, were interesting and easy to get on with. I am very happy with the service provided by Northwestwalks. Thank you so much for a great walk, great guide (Paul) and great choice of accommodation. My first ever guided walk, but it certainly won't be my last. Paul made the walk more of a holiday than a cross country walk and helped everyone achieve their goals and dreams. Hi Dean, I am just writing to thank you, and to say what a great experience the coast to coast was. The trip was everything I could have hoped for and more. It was well organised, Paul was terrific, and the accommodation was always comfortable, sometimes amazing. Even the weather was perfect. I was on the 6 May trip. Hi Dean. I wanted to drop you a line to say how impressed I was with the May 2017 guided Coast to Coast walk. Even though we all put a lot of effort into training before the walk, I think we were all startled by the physical and mental demands of the Coast to Coast. It's a tough one! Northwest Walks organized the walk very well. The accommodation ranged from perfectly fine to truly great, and we had plenty of information about the duration of each day's walk, meals, packed lunch options, laundry/drying facilities, weather reports, grocery stores, cash points, and equipment stores from day to day. The weather in the Lake District was brilliant….., and even on the inclement days later on we managed to find some good views and challenge ourselves. By then we'd bonded into a jolly group and were used to the daily mileage. I especially want to praise Paul, our group leader, whose thorough knowledge of the trail, patience, good humour, thoughtfulness, compassion, and love of the countryside set the tone for the entire walk…… Many thanks for a great experience. Hi Dean, I had an unbelievable time- it surpassed my expectations in every regard: scenic views, accommodation, food, camaraderie, weather, and the friendly leadership of Paul who, with his dry sense of humour, pulled our crazy group together. It was so much fun! Hi Dean….A thoroughly enjoyable walk, through the best of the English countryside, led by a knowledgeable and able guide, and with a great set of people. The organisation was first class and our bags were always ready every night upon arrival at great overnight stops…. The pace of the walk was just right and with 190+ miles to cover, this made it possible for everyone to both enjoy the walk and still have time to enjoy the surroundings. Would certainly recommend NWW in the future. Hi Dean, Completed the Coast to Coast yesterday. First holiday of this type I have ever done. Enjoyed it from start to finish. The walk itself was everything I expected it to be. So for me it was a bit of a challenge but that's exactly what I wanted. A fantastic experience through some stunning countryside. A great eclectic bunch of people to walk with. Good camaraderie all the way. Overall accommodation as good as or better than I expected ….Baggage transfers worked perfectly every day. Great feeling of achievement as we walked along the cliff top down in to Robin Hood's Bay. I could go on at length about our guide and mentor, Scott but in the interest of brevity I shall just say he was absolutely first class from start to finish. A credit to your organisation. My thanks to all concerned in putting the whole experience together. Hi Dean, just returned to Australia having completed the C to C walk in September with David. We really appreciated David’s skill and care on the long trek across the UK. His prior work as a school teacher certainly helped, as well as his Geographical knowledge...I like his dry sense of humour that kept us going on the longer walks. Well done in your selection of him as a guide. Great care and attention to detail, ensuring that everyone got going on time each day. Dear Dean & Team. Just wanted to send you an email to thank you very much for the organisation of our coast to coast walking holiday, 3rd -16th September 2016. From start to finish the accommodation, places to eat & luggage transfer was very well catered for. This being our first organised guided walking holiday we were both very impressed not having done a holiday like this before, it made it all the more enjoyable. As for Dave, our guide, a very very good guide we couldn't have asked for a better person, not only did he know the route, land like the back of his hand ,he was very knowledgeable too and care for everyone's needs however small, a gentleman in every way. BRILLIANT. So much so we would like to book another holiday doing Hadrian's wall… for next year. Again many thanks for a wonderful holiday we will defiantly recommend you. Hi Dean, Just a quick line to say how much myself and Amanda enjoyed our C2C walk recently. It was the first time I've done a "guided walk" and it really does remove all of the hassle from having to book and organise accommodation and luggage transfers. The walk itself was quite tough at times but having a guide and 10 other fellow walkers with you to encourage and keep your spirits up is a great help. Previously on long distance walks I've done, I would have my thumb on the map and be looking at it constantly and getting the blame when we get lost or take a wrong turn. With a guide all those problems are removed and it made my summer holiday that much more enjoyable. Regarding the accommodation, I couldn't fault it really. I think virtually everywhere we stayed was the best that was available in that particular location and they were all conveniently located directly on the C2C path so no extra miles to be done at the end of the day was really appreciated. … As for our guide Pete, what a star he is. He had a diverse group of walkers to deal with but he smoothed over any problems and mishaps that occurred with the utmost tact and professionalism. His knowledge and experience of the walk was excellent and he is a credit to himself and NWW. Dear Dean I returned on Saturday 16th July from the C to C led by John. It was an amazing marvellous and memorable holiday. John was a super guide always cheerful and helpful and a knowledgeable guide. All the accommodation was first class and all the bag transfers went smoothly. The group gelled well and stayed focused throughout the whole walk. Well done you in ensuring a perfect walking holiday went smoothly and successfully. Dear Dean and Corinna, Thank you for everything about the Coast to Coast. I had a fabulous time … and no blisters. Dear Dean and Corinna, Just a line to say how much I enjoyed the Coast to Coast walk and thank you for the excellent organisation for both the booking of the trip and the trip itself. The B & B’s and the pubs chosen for the accommodation were excellent. The proprietors always welcoming and the food enjoyed by all. Very importantly our guide, Scott was professional, knowledgeable and extremely kind and aware of each person in the groups needs. For me it was a perfect trip. The right combination of everything – the walk, the guide, the group and luckily for us, the weather. Dear Dean and Corinna, I would just like to tell you what a fantastic time we had on your Coast to Coast walk...... I’m sure you are aware of what a treasure Scott is. I felt so lucky to have such a professional, knowledgeable, and passionate guide for my walk. He truly took my holiday far beyond expectations. He was able to spot problems people were having and dealt with them privately, with suggestions and encouragement. He is good natured and fun to be with. He was amazing. I am so glad we found Northwest Walks on the internet. Hi Dean, Graham and I arrived back home on Saturday after completing the Guided Coast to Coast led by the incomparable Dave. It was one of the best things we've ever done. We cannot fault the organisation and attention to detail provided by NWW - you even provided a virtually rainless fortnight - how good was that! All the accommodation and places to eat were excellent …..We enjoyed some stunning scenery and ventured into pockets of the UK that we have never been - its good to know that there are still some less trod paths. Our diverse group bonded from the word go and we enjoyed some great banter during the day and every evening when we all ate together. Please pass on our deep appreciation to Dave who exuded a calm and measured professionalism, quickly picking up on any individual needs and help. His knowledge, huge experience and leadership skills made the two weeks a profound experience. It all too sadly came to an end at Robin Hood Bay. The sense of achievement was quite moving and has given me a renewed confidence that I can do stuff! Thank you all so much for making this one of our best 'holidays' (I use that term lightly after the road to Blakey Ridge and The Lion Inn!). We may well be back for another trek. Hi Dean, I just want to thank you for a great Coast to Coast trip from August 1 to 14. Don and I could have done it without Northwest Walks, but having done it with Chris as our guide and the great group of folks who came along we realize how wonderfully stress free and fun the whole event was. We had a wonderful time. I sometimes organize events and so I think I can appreciate how much fine tuning you must have done over the years to make it all go so smoothly. We were really impressed by the attention to detail, the choices of accommodation and the professionalism of Chris who soon figured out the groups weaknesses so he could make the best route choices for 100% group success. The whole trip exceeded our expectations. Hello Dean, I have been back in Oz for a couple of weeks now and would like to pass on feedback re the C to C that I walked with your organisation from 6th to 20th June. Brilliant! I would recommend your Tour/walk to anyone who is game to take it on! Firstly I wish to laud Peter our guide who did a great job, keeping us on track, up to speed, motivated and safe….. …If I ever decide to do this again, or walk elsewhere in the UK, you have got my business!! Dear Dean, thanks for superb walk and organisation ….. I have returned home from my holiday and want to thank you for my two walks. I thoroughly enjoyed the coast to coast and can't fault it, the guide, accom and walk were excellent. Mont Blanc was also excellent...The guide, accom and walk were excellent. So thanks, I will hopefully be doing more of your walks in the future. 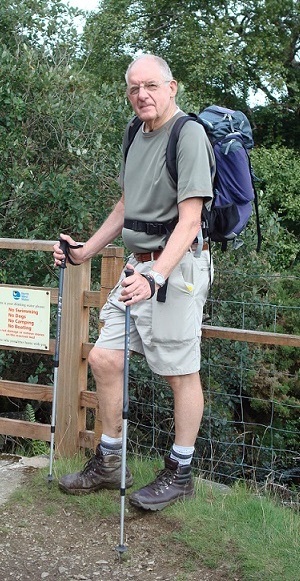 Just to say that we all thoroughly enjoyed our C to C walk last week but what really made it was our guide Dave. He went out of his way to make everything so enjoyable and for myself had very interesting talks on the geology of the landscape...Once again thank you. Hello Dean, I just wanted to say what a fabulous walk the Coast to Coast was. I would like to mention Dave was a fantastic guide, And to Thank him very much. Dean, Rich here...The walk this year was one for the records! No rain for the complete walk .......incredible! Great group and Dave was as wonderful as last year; easy going, knowledgeable, and considerate .........a real asset to NWW. The accommodations and walk distances are near perfect. It was a great walk this year and it took me six times to hit perfect weather......looking forward to more of these! Looking forward to the 2015 season and TMB. Dear Dean, My wife Karen and I were completely blown away by the level of organization that we experienced over the whole walk, Firstly Chris Webb was a brilliant leader, caring, organized and supremely experienced. He was a credit to NWW. .The accommodation was, without exception, superb. The B&B owners were always friendly, obliging and also well organized…Our luggage was transported without fuss, no damage or loss . What more can I say? Our group was well paired off for the accommodation and we came away with 11 new friends. Yes we all got on famously. My compliments to you and your staff for arranging the whole trip. Our only problem is now that we will be comparing any other walk we do with the NWW CtoC. Thank you for a great experience. I need to say just what a wonderful time I had. We were very lucky with the weather and the group were lovely but I do think that Chris was the best leader...Also full marks to you for all the organisation and the lovely accommodation. Hi, All in all a fantastic experience, which I’m very happy I did. The guide (Chris) was fantastic, the best I’ve ever experienced. He was quick to judge our strengths and weaknesses. He was helpful and informative and cared about getting us all there... I would not hesitate to recommend Northwest Walks to anyone. I would definitely consider another guided walk with you...My fellow coast to coast walkers were all wonderful and I feel I’ve made some new friends...Thanks again, I hope I can persuade some friends to do this walk with you. Hi Dean compliments to your organization for the whole package and of course Steve, our guide who does a fantastic job. Everything went smoothly as per my other 2 walks with NWW and accommodation was up to the usual high standard. And you threw in almost 2 weeks of fine weather. A bonus. Good food, a great group to walk with, and the scenery, all made for a very enjoyable 2 weeks of walking. Hi Dean and Corinna. We completed our coast to coast walk on Friday. What a wonderful challenge it was. We had a super bunch of people who got on so well and when we farewelled each other on Friday night there were hugs and tears. We will keep in touch. It was such a pleasure to get to our b and b's at night and they were excellent. Very comfortable. Lovely friendly hosts. They went out of their way to make our stay pleasant. Our guide Chris: what an amazingly caring, knowledgeable and wonderful person...We will be recommending NWW to friends as you were recommended to us. We loved our walk and can't thank you enough. Hello Dean and Corinna. I have just finished the coast to Coast walk with Chris... It was truly fabulous in every way. The accommodation was also perfect...Also I think you paired us very well for the accommodation but it was a great fun group of people. Thank you once again everyone. I would love to do another walk with you at some stage and I know others in Australia will follow my recommendation. A very memorable holiday with lots of stories and photos. Dean & Corinna, Just wanted to drop you a line to say thanks for such a well organised holiday, resulting in, what was for me, a fantastic experience Our group (C2C 7th to 21st June) had a great time and I really cannot think of anything to criticise. Steve was an excellent guide, easy going, but making sure everything went smoothly…Once again thanks for the great organisation. I wish to record my appreciation for the organisation of this excellent walk. Every part of it was a life enhancing experience. The organisation was faultless and our leader was clearly very experienced and knowledgeable. His calm manner and approachability inspired confidence...The entire experience was magnificent! The group bonded, the scenery breath-taking and even the weather was kind .Could not have asked for more! At the end of this is the warm glow of having successfully walked 192 miles and this has been possible very largely to North West Walks and their organisation. Dear Dean & Corinna, Thank you for organising our C2C holiday, which we were very pleased to successfully complete last Friday. I thought it might be useful to provide you with some feedback. We thought the organisation was excellent and the standard of accommodation far exceeded our expectations....A credit to NWW is Paul our guide. Not only an excellent guide, who led & supported the group of mixed experience & ability so well...Please pass on our appreciation to all involved. Thanks again. Hello Dean, Having just completed the C2C walk I would just like to say what a fantastic time I had. The walk itself was superb and the organisation was very efficient. We were expertly led by Paul who was also great company in the evenings. With thanks for a very memorable holiday. Dear Dean and Corinna, I have just returned from the walk and would like to say what a truly fantastic experience it was. The organisation was brilliant as was our guide Paul whose expertise ensured that we arrived at our destination as planned each day, he also included many points of interest along the way and made time for us to take photos. His knowledge of where to eat in the evening also ensured that we all had superb food, so much in fact that I thought I would have put on weight, thankfully that wasn't the case. The accommodation provided exceeded my expectations so all in all a wonderful holiday. Dear Dean, Thank you for everything. It was a great holiday for me. Everything was great and I enjoyed so much. I have no words for Paul. Great guy, great guide, we had great laughs together and great discussions. I have been meaning to write after completing the Guided Coast to Coast (1st June - 15th June) this year.Superbly organised! Thank you so much for all the work which, I'm sure, is quite considerable. We found the booking arrangements were very efficiently dealt with too. Being used to tenting wherever we go here in Australia - AND carrying it all - I found the accommodation to be luxury ++ !! Being guided also made for a relaxed walk. Wouldn't have changed a thing - even the weather was wonderful; raincoat on for half an hour during the entire walk. A long-held ambition achieved with many fond memories. Thank you for an excellent two weeks. Both Mary and myself enjoyed the C2C walk with Wayne our guide being both informative and friendly. We were amazed that everything went so well, the luggage transfer was brilliant, the accommodation excellent, the group we were with all got on well. Thanks for a great walking holiday. Good morning dean. the coast to coast walk was an amazing trip and experience. I did it all ! The most beautiful sceneries and landscapes. I will speak highly about your company and i will book another walk for 2014 ! Steve is a wonderful guide. Just a short note to compliment you on the organisation of the walk, from the website information to the baggage handling to the bed and breakfasts which were all first class. I did the Coast to Coast in September 2012, and it was just a great experience...And of course compliments to our guide, Scott. Very experienced with a good sense of humour, he did a great job. thanks again, will be back for another C2C with your company. Unforgettable. Just wanted to say how much I enjoyed the Coast to Coast Walk. I should first of all say a big thanks to Wayne - he made the walk a really memorable trip and I enjoyed his company. The accommodation was cracking - I loved the diversity of places (and hosts!) to stay with. The weather was brilliant so we were very lucky all round. We just want to say how much we enjoyed our coast to coast walk. It is something that we had been thinking and talking about doing for a few years now. We are so glad we have done it and that we chose Northwestwalks. It was first class accomodation and arrangements throughout. A big thanks also to our excellent guide Paul for helping to make it an unforgetable experience. I just wanted to let you know how much I enjoyed the coast to coast walk over the last 2 weeks, Steve was a wonderful guide, we couldn't have had a better one, and the weather was kind to us as well! Belinda and I were getting enthused about doing the Mont Blanc walk next year so we may be in touch! just a quick email to let you know how much I enjoyed the Coast to coast walk Steve was fantastic. A very good guide and very knowledgeable in the history and geology of the walk and his people skills were second to none. The accommodation were far above my expectations, thanks for a terrific walk i'm sure you will see me again. I must tell you how much i enjoyed the C2C walk that we completed on Friday, hard, yes, but fantastic scenery, the standard of accommodation was first class with great breakfasts. We all agreed what a wonderful guide Scott turned out to be, giving excellent leadership and a really supportive side to the less able or fit in our group, full of praise for him. I am writing this email to say thank you for a very special holiday which was well organised and well led …As it turned out the accommodation booked by North West Walks was excellent and my big nightmare of sharing a room with a stranger was not a problem - I got on with my roommate… straight away and we will very likely do some other walks together. Our guide, Steve, kept a careful watch over us and quickly assessed the strengths and weaknesses of the group … So, all in all, a brilliant experience not to be forgotten. Just a quick email to say thank you for the Coast to Coast walk. The holiday was excellently organised and the accommodation was extremely good – I cannot fault it at all and it all contributed to one of the best holidays I have ever had. If I hear of anyone else who wants to do the Coast to Coast I will certainly recommend you to them. I want to thank you and your team, as well as our guide John, for helping us to enjoy one of the best vacations ever. Mary and I successfully completed the Coast to Coast on August 13th. It was exhausting, challenging and rewarding at the same time. Just a short line to say to thank you and your team for an experience of a life time in completing the coast to coast, steve was a good guide and his depth of knowledge was very interesting and eye opening. Dear Dean, Charles has now come home proudly bearing his certificate which is displayed in the kitchen. The walk was extremely well organised and all praise for Bob for his wonderful support and guidance. A quick note to tell you how much I enjoyed the Coast to Coast Walk under the efficient guidance of Steve! A most memorable two weeks that I will never forget and I would like to congratulate Northwestwalks on the overall organisation of the walk. The days were tough but the overnight accommodation was always comfortable and you have obvioiusly researched the specific pubs and B&Bs. Good beer and good food.